Now the real pumpkin season begins. Germinating time is a bit tedious to me. At time it seems that it takes forever for the seedlings to start growing. This last week my plants really started to take off. Burned the edge on one of the 1204 plant's leaves because it grow into the bulb overnight. I should have had my plants in the ground four days ago but because of cold overnight temperatures and being so busy with my website design business I haven't had a chance to get my hoop houses together. Finally got that mostly done last night. This evening I put the plants in the ground. I've had clear plastic over the planting area so to help warm up the soil and it seemed to work fairly well. The soil was relatively warm a foot down which will help the roots want to grow and help minimize shock to the newly transplanted plants. In each planting hole I put a touch of Azos, some myco, humic acid and a touch of earthworm castings. I loved the smell of the soil. Sweet and healthy. After planting the plants with the first true leaf in the opposite direction of where I wanted the main vine to run I gave each plant a deep drink with a small touch of liquid seaweed in the lightly warmed water. I pot two plants in each hoop house and when the plants have grown to the point that the leaves are touching I'll take out the weaker plant and then we hope and pray that we chose the right plant. At this time of year the plants can be deceptive. A vigorous growing plant doesn't necessarily indicate that it will grow the biggest plants. 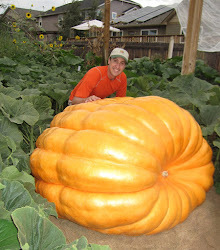 Some plants genetically just want to grow salad which doesn't do a competitive giant pumpkin grower much good. I usually look at the leaf color, leaf health, stump area and then throw some dice to decide which plant to go with. There is some science but it is mostly just a got feeling with a touch of experience. In one hoop house I have a heat lamp and in the other hoop house I have thermostatically controlled space heather. These will keep the plants warm on cold nights. The next few days the evening lows look pretty kind for this time of year. Tomorrow morning we will see which plants look happy.